Tomorrow I head home from my wonderful San Francisco vacation. The evening sky still glows an azure blue, as I watch the oak trees silhouetted along the top of the ridge outside my bedroom window. I’m thinking of Bree, main character in the novel I’m currently writing. Part of my reason for this visit (besides spending time withLinda, my delightful writer daughter) was to get a feel for the area where Bree spent all her life before her recent move. 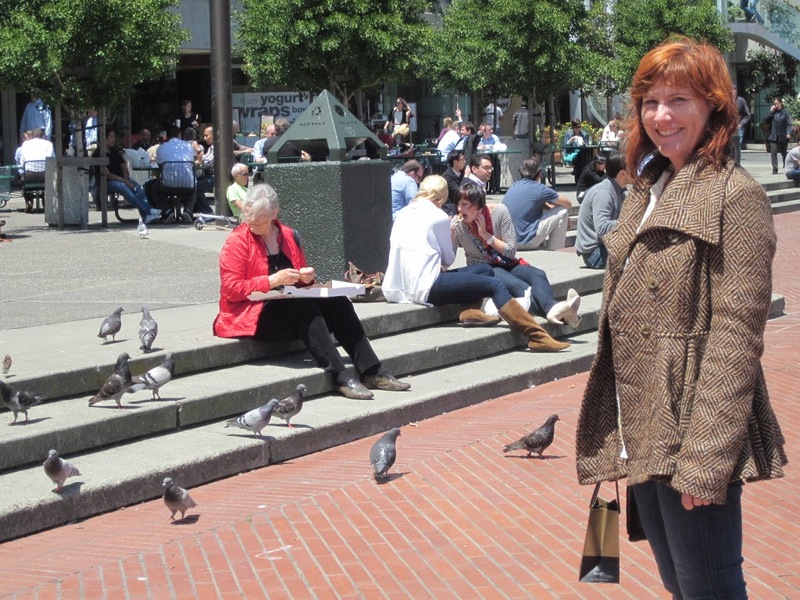 So Linda and I spent time in the Embarcadero area, where I imagine Bree spent time skateboarding with her friends. I got the feel of it in a way I couldn’t from just reading–the smell of the breeze off the bay, and the sounds at noon, with folks grabbing wraps from the nearby lunch stands and sitting on the steps by the fountain and fending off the pigeons looking for lunch as well. And now I have a memory, a Bree memory that has already popped up in the new scene I wrote this week. I love doing research this way, for my stories on vacation. It makes me see and feel and experience all of life, not just my stories, in a new way, an all-of-the senses way. Try it. Wherever you travel this summer, listen, and taste, and smell. Look at the colors and shapes of all you see. Writer or not, it’s wonderful research for Life. I just felt the slightest touch of the evening breeze. Must sign off now, to go outside–to taste and smell, and feel it, before I head for home tomorrow. Great post Peggy. Its fantastic when you can combine a vacation with research. Im happy you had a great time in San Francisco. I love that city.